Industrial development is and will continue to be an important source of jobs and income for many communities throughout the boreal forest. However, along with climate change, development poses long-term implications on the future health of the boreal forest. The footprint of natural resource extraction industries the boreal forest already encompasses an area of at least 730,000 km2 (180 million acres), largely from forestry, hydropower, mining industries, and oil and gas extraction. More than 30% of the Canadian Boreal Forest has been reserved for some form of current or future industrial development overall. New resource roads are pushing further and further north into the heart of the boreal each year, demonstrating the need to conserve large portions of the forest to create a balance in the boreal forest. Between 1990 and 2008, around 46 million acres of forest were harvested in Canada at an average of more than 2.5 million acres per year, with historic rates estimating around 65% coming from the boreal forest. More than half of Canada's boreal forest products go directly to the United States, with the majority coming in the form of pulp for paper and manufacturing. Harvest rates have slowed in recent years, however the extent of boreal forest reserved for future timber operations means that long-term planning and sustainable management is needed. There are signs for hope when it comes to timber harvest practices in the boreal. The Forest Stewardship Council provides third-party sustainable certification and even offers a boreal-specific standard. More than 100 million acres of boreal forest fall under a form of sustainable certification, ensuring that these forest products are removed with care and an eye on ecological health. 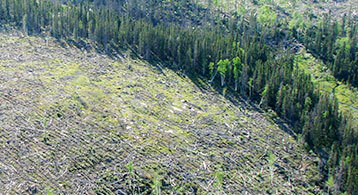 Additionally, the historic Canadian Boreal Forest Agreement—an agreement between 19 forest companies and 9 environmental organizations that was signed in 2010—saw nearly 110 million acres placed into special sustainability management areas and the suspension of operations on additional 72 million acres to allow for declining woodland caribou populations to stabilize. For more than 200 years, explorers have been setting out upon the boreal forest with the hopes of discovering mineral riches. Many of them did, and to this day mining continues to play a large role in the Canadian economy. Unfortunately, many of these mines were constructed with little to no environmental oversight or with the long-term health of the forest in mind. Today, more than 7,000 abandoned mines can be found scattered throughout the forest, with more than 3,000 of them within 1 kilometer (0.62 miles) of a lake, river, or stream. Some were left in such bad condition that contaminants could still be found leaking into nearby waterways decades after closure. Many provinces still feature antiquated 'free-entry' mining systems. These essentially permit mineral staking almost anywhere in the boreal forest and, in many cases, gives whoever owns those staked tenures the primary rights over using the land regardless of who or what is nearby. This has led to numerous conflicts with nearby affected Indigenous communities, which in many cases were offered no say in approving the projects or any tangible benefits—jobs, community funds, etc.—from the new developments. A less discussed threat posed by mining is the 'spider web' effect of access roads. In many cases a road to a single development site opens the area up to a new wave of exploration, eventually leading to a spider's web of new roads and developments in the surrounding area over time. When most people think of oil extraction in the boreal forest, they're thinking about the oil sands regions of Alberta and Saskatchewan. This wide-sweeping region contains bitumen (which can be processed into oil) below the surface where it is extracted via large strip mines or networks of pipes that pump it out of the ground using steam. Oil sands activity has already directly impacted 175,000 acres of Alberta's boreal forest with the potential to grow much larger in the coming decades. More than 66% of the 140,000-km2 (34 million-acre) region has been leased to companies for extraction. However, oil sands extraction is far from the only threat to the boreal forest when it comes to oil and gas. More than 155,000 active gas wells are currently operating in Canada's boreal forest while an additional abandoned 117,000 gas wells remain scattered throughout the boreal, around 87 of which fall within 5 kilometers (3.1 miles) of a lake or river. The western boreal has been hardest hit, with expansive regions in British Columbia, the Northwest Territories, Alberta, and Saskatchewan already experiencing heavy drilling with more wells planned for the future. Although often thought of as a relatively 'green' form of energy production compared to oil or coal, hydroelectric development comes with its own fair share of environmental concerns. Migratory fish, including salmon and others, become blocked from accessing their spawning grounds upriver. Decreases in water flow often lead to increases in the distance of saltwater intrusion into river mouths as well as slumping and erosion of river banks downstream. And the areas above dams that become flooded with water remove large areas of productive habitat for a wide range of species—from fish and birds to large mammals such as caribou and wolves. 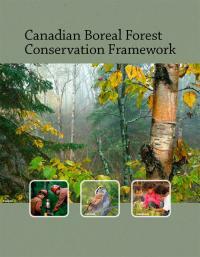 Canada's boreal forest has been considerably affected by hydroelectric development to date. More than 625 large dams are currently producing hydropower across Canada, with at least 40% of production coming from rivers originating in or flowing through the boreal forest. Large dams have been estimated to have affected more than 130,000 kilometers (80,000 miles) of rivers, while more than 52,000 km2 (12.9 million acres) of terrestrial habitat has been lost due to associated flooding above dams. The Boreal Forest Conservation Framework brings together stakeholders from business, communities, Indigenous governments, and others who care about the future of the boreal.